If you're not familiar with the concept of Pass The Page, you might want to start the blog hop 'officially' at Letting The Days Roll By where all will be explained. And, as an added bonus there's a few prizes to be had for commenting along the way. My part in the blog hop was to adapt Sian's rather beautiful layout (which always meant that mine would look rather dull by comparison.) Initially, I was inspired by Sian's use of layering, as well as the overall balance of her page. I liked the large rectangle created by the papers in the bottom half of the page and the embellishment cluster. However, the thing that I always love the most about Sian's pages is her emphasis on storytelling. There were many twists and turns in the completion of my layout, so it's totally different to how I imagined it! But, I got the story down on paper - so that's good enough for me! Aww... lens still not fixed, what a pity Clair. Love the page - I don't remember seeing it while we were away, so maybe you were good at hiding it. Just found you from Sians blog - I think I would have felt the same following Sian. I'm enjoying following this hop and seeing how everyone interprets the page and makes it their own. I have to say that your LO is in now way dull...am enjoying seeing what everyone has made of the previous LO! I have been SO looking forward to seeing how you took my page and "Clair'd" it! It's beautiful and it has me sending out a plea to you to come back and blog a bit more often. Please! Now, I'm going back for another little look before I move on.. Telling a story is a great thing to pull from the Sian's layout! Love the clean simple design to this and the title is great! I love how this is progressing! Lovely page! I love the way you've taken the elements of Sian's interpretation of the design and given it a clean but complex look, with that lovely patterned paper, and the blorder around the close-up of the conkers. Very stylish! Love the title for this page, and how you have used Sian's layout as inspiration. I love the simplicity of your page and that title is a corker! I hope the camera isn't going to be too expensive to get fixed. Welcome back to blogging - I've missed you! Love your page - don't remember it from the retreat (perhaps done while you should have been sleeping!) - but the close-up is fab (specially manicured nails?) and the PP white space is a great foil for the journalling! Happy New Year Clair! Great to see you again. I love what you have done with the page - it is fantastic! Good luck with the camera/lens repairs. 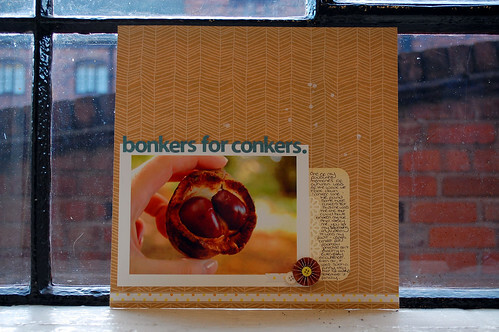 What a great title - love your photo - is that what conkers are?? And hope your lens gets repaired soon! Cant live without my lovely Nikon! Wonderful!! I love your take on Sian's page! Now I can see my own layout taking shape from here! I've popped across from Sians. Great page. I love your page (especially given the circumstances) and I was delighted to see paint splatter returning. Thanks for joining in and I hope you will again if we do it again.